When Derek and I first got married, he INSISTED I learn how to make Chicken Pillows because it was his favorite dinner.My initial thought was, “What on earth are Chicken Pillows? !” Once I tried them and bit into this “pillow” of joy and deliciousness, they soon became a favorite of mine, too!They are really, REALLY, good! Soften ¼ cup butter and 8oz. block of cream cheese. Then stir to a smooth consistency. Add cooked shredded chicken to the bowl. In a separate smaller bowl, put the egg and a little bit of water, maybe a couple Tablespoons worth and beat together. Dip the "pillow" into the blended egg. After dipping into the blended egg, proceed to dip it into the crushed saltine crackers and place on cookie sheet. Repeat for the remaining 7 crescents. Put can of cream of chicken and milk into a sauce pan. Add as much milk as you want to get it to the consistency you want i.e. thicker or runnier. When hot enough add 2 spoon fulls of sour cream and cheese to your liking. So...I'm adding ALL of these to my recipe book!!! THANKS!!! And I'm sure my hubby will want to thank you too!!! Just made these this afternoon. Delish! I didn't end up using the sour cream in the sauce, but it was great without it. Thanks for the recipe! I am using 4 of your crock pot and easy recipes on here for my back to school week. Thanks! this is one of my favorite dinners as well. Crescents just make everything so good. how many chicken breasts would you use for this, for every 8 pack of crescents? and how many does one recipe serve? What did you serve as a side dish with this? OH MY goodness!!! Can I just say how much I LOVE your blog?!! I am so happy that I found you - what great real life recipes. I have to try these! My husband will love them too! I have to say this is one of the best food blogs I've seen. I can't wait to try your recipes.... thanks for sharing! These were great!! My Mom always made a similar recipe with dry Stove Top stuffing on top. These were better and I never thought I would say that because they have always been one of my favorite. Plus, all 3 of my kids ate them up!! Thanks!! i am getting ready to make for dinner tonite! of course, i am adding my own touch, a little bit of zucchini inside the pillows...yumm! cant wait! thinking bout making your banana cookies also! What cheese is best used to put on top? I just made this, it was amazing. I'm gonna try it with ritz crackers next time, or I liked the idea of stuffing that someone suggested. @EKM I used a shredded colby jack and Monterrey blend. @~*~Series of Blurs~*~ I have done Eitz crackers too! Either way is super good! I just use whatever crackers I have on hand! @Anonymous I put in probably anywhere from 1/4 cup to 1/2 cup, just when it gets to the consistency I want it. @Anonymous It must have disappeared. Sorry about that, that is weird! I think I fixed it now, let me know if you have any problems or if it is still not showing up for you. Thanks for bringing that to my attention. Made this last night but instead of making individual "pillows" I rolled out the crescent dough placed the filling in the middle and wrapped the dough over the top. I brushed the egg/water mixture over the top vs. dipping and it was super yummy! The one thing I noticed is one large "pillow" might not require the entire block of cream cheese. Oh! And did I mention I uses all low fat ingredients?!? Super easy and delicious! Thank you Chef in Training! Made this tonight!! It was awesome!! I used 1/2 c Shredded swiss cheese for the sauce and low fat cream cheese and 98% fat free soup. Family loved it too!! Thanks Chef in Training!! P.S. for anyone in Weight Watchers with what I used it is 13 points plus including sauce!! Worth every point!! Thank you jcsmama for adding the weight watchers points. I am on that diet and was afraid I would just have to watch my husband eat this alone. I have 15 points left today and will be able to eat this with him =). My husband usually does all the cooking and I kinda felt inspired today to return the favor. Off to the grocery store I go. Made this tonight and so yummy! Thanks and I will make it again! Made this the other night and my daughter is already asking to make again, so yummy! Loved this recipe! Changed it up a bit but it was delicious! You seriously need to publish a recipe book! Literally everything looks and sounds amazing....wow! I made these last night for dinner and oh my were they incredible...Thanks for the recipes!! Have made these twice now, first time I followed the recipe but the second time I decided to add some spinach and Worcestershire sauce to the mixture and I rolled the pillow in Ritz crackers vs the Saltines. It was amazing!!! Do these freeze well? What directions should I use to reheat? I'm making them for a family member who just had a baby and would like to gift her some as a meal. Another person who could not print. This has been the case everytime I try to print, no matter the blog. Is it a pinterest problem or am I just choosing all blogs that don't print??? VERY frustrating! But I liked the Chicken Pillow recipe enough that I copied it by longhand! what are some good sides for this dish? Mashed Taters, noodles? I would serve this with green beans or a green salad- definitely not mashed potatoes or noodles, there is already plenty of fat/carbs in crescent rolls, butter, cream cheese, crackers etc. These sound yummy but I would have something light and fresh with it for balance. Just had this for dinner and OMG does not even come close!!! This is going to be a regular guest on our lineup! !We had this with a big salad and all are now enjoying strawberries with yogurt and cinnamon as the dessert! All so filling, light and delish!!Thanks! As you can see, even when you so thoughtfully corrected this sweet lady, you made a few mistakes yourself. At least you made a lot of people laugh with your pointing out how proper you were. Just enjoy these great recipes and stop trying to be perfect. No one here on earth is, darling. Some people do not have anything to do except criticize. You just made yourself sound ridiculous. We are not in school at the moment, but if you let us know where to meet you, we would be glad to have an English lesson. You would be better off if you just made this recipe and not comment in the future!!! Seems like if u were so peeved about the words used & actually wanted to teach u would have included ur name, not Anonymous. You just look like a cowardous troll. Stop trying to correct others and focus on yourself. Get to the root of why u feel u need to correct others..
My husband grew up on these too, so I inherited the recipe when we married and my side of the family was introduced to it too. Our recipe also calls for a small can of mushrooms, and we just roll them in bread crumbs (although your picture does look like a crispier coating, I'll have to try that). We don't add anything to the cream of chicken soup (except the milk). I haven't tried freezing the finished product, but if I have frozen the filling (good when there is extra) and it has been fine for the next batch. "wit" isn't a word either. If you can't say anything nice, don't say anything at all. I have this basically same recipe from 30 years ago.like a different version. Made tonight, definitely a keeper! I just made these tonight but I used reduced fat Garden Herb Cream Cheese and extra spices in the chicken. I had to keep swatting hands with spoons to taste test before the mix even made it in the cresents. I would make this mix for chicken salad (dont like mayo or sour cream)! This was SUCH a hit tonight the girls asked to make it tomorrow too. THANK YOU! I made these tonight and they were great!! Love this recipe and will be making it again,soon! Thanks love all your ideas!! Anyone know the Nutrition info on these?? These are delicious.....made them last night for dinner! This will definitely be added to the recipe collection. We make these, but dip them in stuffing mix with added almond slivers--absolutely divine! I did everything except I used plain bread crumbs instead of saltines. I HATE saltines and I added a little bit of the cream of chicken to the mixture that goes inside. It came out a little creamier than usual and was really good! These look so delicious! I think my husband would love them too. This recipe is definitely a keeper. My husband and kids loved it!!! Thank you! I made these but with filo dough and added spinach and swiss cheese! Amazing!! Just made this tonight. Did the whole recipe as listed, but so glad I had two packages of crescent rolls! I was able to make 16 with all the filling. Tried to make bigger at first, but if I stretched the dough too much, it would tear. I also used about 2/3 cup of milk in the soup, and sharp cheddar for the sauce. LOVED, LOVED, LOVED this recipe! Sooo good! It was a hit with the whole family! Will definitely make again. Also love how you can "tweak" it. Thanks! Made these the other night and I love them! So good! I will definitely be making this again. This was the first recipe I have made from your blog, and my family LOVED it! Thank you so much for sharing all your great recipes. I can't wait to try them all! I made these last night for supper. OMW.... they are awesome! Even my picky 4 year old loved them! It took me what seemed like a long time in the prep but now next time I will know what I am doing and it won't take as long. My husband even put the sauce over his mashed potatoes! Thank you for the wonderful recipe!!! I like this.I revised it a bit tho. i added a pkt. of dry ranch dressing and about 2 tbs. of bacon bits. i was great too. I made this for my family tonight & I've never had so many compliments!!!! Everyone loved it and my husband said I need to make it every week! Thanks so much for sharing! Made this for dinner tonight. YUM. It is going into our regular rotation - although, not too regular, because as awesome as it tastes, it isn't extremely diet-friendly! :) ....... I poached 3 chicken breasts & had plenty of filling. I couldn't stretch the rolls too much b/c they kept tearing, so I just put a couple of tablespoonfuls of the filling on the large side & kind of wrapped the rest of the crescent around it. For the sauce, I used closer to 3/4 cup of milk & about 1/2 cup of cheddar. Definitely a keeper!!! These look wonderful, but that d@mn cream soup!!! LOL I would love some suggestions for a sauce that don't involve opening a can or a jar! Thanks in advance! I just tried this tonight and it was a definite hit! I followed the recipe exactly and it was so yummy. I served twice baked potatoes on the side, but that was a bit too heavy for this meal. Next time I'll serve a side salad or some roasted veggies instead because the "pillows" are fairly dense and very filling. My mom made these when were growing up with the leftover turkey from Thanksgiving :) I have made them with both, but never with the sauce, will have to try it next time, thanks! Mom in VA-For the sauce you can make a traditional white sauce but instead of all milk, use 1/3 milk, 2/3 homemade chicken broth. I just made the Chicken Pillows. Oh my goodness, they were good. I added some ground sausage and mozzarella to the cream cheese/chicken mix, I also added fresh chives to the sauce. I substituted low fat/fat free ingredients where I could, as well. Love, love, love. Will definitely be making again. Thank you!! Are we using unsealed butter? Thanks for the recipe - can't wait to try it!! I used rotisserie chicken , shredded it. My family LOVED this!! They ate every drop of the pillow chicken!! I will be making this part of our weekly menu!! I want to try these! I think I will try with italian bread crumbs instead! I cut the butter and used 1 package of thawed drained spinach. I also added a generous sprinkle of the following: garlic powder, onion powder, white pepper, black pepper and sea salt. I snuck in a very light dash of nutmeg too.. I had a little trouble at first trying to figure out exactly how to encase the filling into the cresent roll dough.. in the end i used 2 triangles still attached (in a retangle) pinced the middle seam closed, filled with about 1/4 cup of the filling and folded the dough around it, pinching the sides and end together. I highly reccommend making homefries with this, baked or fried (I actually did both) and smothering them in the creamy sauce too. OMG! 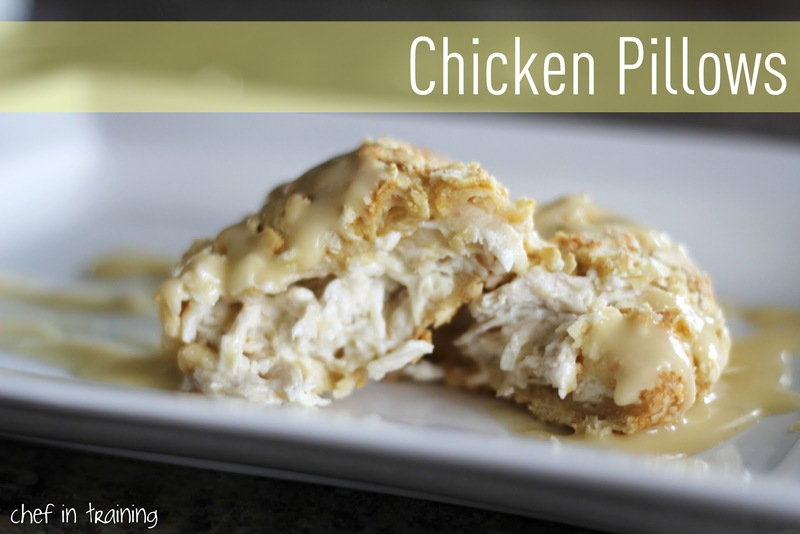 I've never seen someone else post a recipe even remotely close to what my boyfriend refers to as "chicken diapers". It's a recipe of his mother's and he loves it. We make it almost the exact same way, only exceptions being that we fold the crescent dough like a diaper around the chicken filling...hence the name and use seasoned panko breadcrumbs instead of crushed saltines. Glad to see someone else has been introduced to the recipe via significant other! I use a colby jack and monterey blend. Cheddar cheese is also really good :) Hope this helps! Let me know how you like them! Have a great day. these were good different but good like a biscuit cover chicken cordon bleu, next time I'm gonna add cheese and ham to the ck stuff cant wait. Thanks for the recipe. Used to make something similar all the time and haven't in forever! When I used to make them they got dipped in melted butter and rolled in crushed Stove Top Stuffing mix. Also threw some pecans into the creamy chicken mix. Now that I've been reminded I'm going to have to make some of these a.s.ap. and try it your way :). Oh and never ever made the sauce and they were still super yummy :). Hi! Found this recipe on pinterest and have been wanting to try it for awhile because it sounds amazing!! I ended up doing an adaptation of this recipe instead because I had some ground beef I wanted to use up. I used half a pound of lean ground beef and cream of mushroom soup instead of chicken and cream of chicken. It's gone. It was soooo good and I can't wait to try the original version! Thanks! 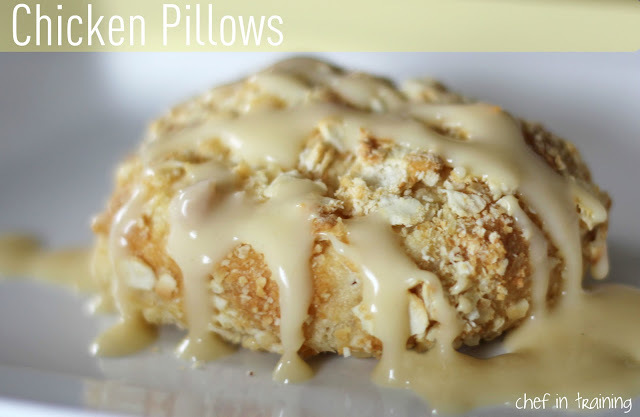 I made these yummy pillows of delishiness! They came out perfect. Next time I think that I might use Ritz crackers instead of saltines to give an added burst of flavor. Very tasty recipe. I made these tonight and I have to say they are a huge hit. Can't wait to make them again! Great recipe!!!! My husband raved over these! They were very easy to fix! I even used canned chicken. I will be making this recipe again very soon! Thanks! I made these tonight & they are YUM-O! My kids loved them too! I used Panko bread crumbs on the top (I was out of Saltines) These will definitely be put in the rotation of recipes around here! Thanks for sharing!! Just made this for dinner, and it came out amazing. Will definitely be making this again!! These are amazingly good! If you add pecans to the chicken mixture it adds a nice something to it! As yummmmmmmy as this looks I could just imagine the calories... Any Idea?? per serving? Just made these with leftover Turkey, instead of breading and sauce i just topped each one with a 1/2 of slice of swiss cheese, yummy! Thanks for the inspiration! I've made this a couple times. I use 3 large chicken breasts, 1 8oz package of cream cheese, and 2 cans (14) crescent rolls. It makes exactly enough. Delicious! ****SHREDDING TIP**** after cooking the chicken breasts (I poach mine in chicken broth) cut them in half, add to a large mixing bowl, and use a handheld mixer on low to shred the chicken. I found this tip online and it worked perfect tonight! Saved me so much time and effort! Nevermind, I see what you said now. I use the Philadelphia Block cheese and leave it out a room temp to soften. I am going to make chicken pillows for Christmas with my family. There is 12 of us. What is your recommendation for a side dish? I've never heard of Chicken Pillows until now! But now I want them!! We love these too! They are also divine if you use cream of chicken with herb soup for the sauce. We tried it once and have never turned back. Oh my my this will be made at the Wanser house..looks yummy thank you for sharing! I made these for my family this past week. They are in love, and asking for them again already. Thanks for sharing! Made these tonight. Good start but will add salt, pepper, and some spice to the filling. Ditch the canned soup....little flavor and way too many calories and sodium without much bang, a simple cheese sauce would have been a better choice. Thank you SO much for this recipe! I made these tonight for my family of 6. I only made one batch since this was my first time making these (I am a terrible cook), and they all wanted more! We used Ritz crackers instead of Saltines since that's all we had. It was delicious! We will be making these again this week. Thanks for your recipes, I will definitely be making more! These were wonderful! My husband raved about them too! I made these last week and my husband loved them! He liked them so much I had to make them two days in a row. Thank you! These chicken pillars were fantastic. I used cream mushroom soup instead and was good. I used White Cheddar Cheeze-its instead of Saltines, and it was great! A little more flavor. hi...could you please illustrate with words or photos how to fold the pillows ? Also how to stretch them...i.e. how much and into what shape ? Thanx !! I saw this on Pinterest and have repinned it for later use. These look yummy and easy to make. Can't wait to try them. I made this last night for Valentine's dinner! The first thing my boyfriend said when he saw me defrosting the chicken was "Chicken again?!" and boy, did he quickly take back that statement once we were sitting down to eat. He LOVED them and thought it was the best dinner I have ever cooked! I used the Ritz crackers Garlic Butter kind and it was perfection! I would have never known these existed if it wasn't for you and I will make it again and again. Thank you so much! Do you have a Facebook page?? Delicious! I have made this twice. First time was for daughter and her hubby, so I did as per recipe. Second time for my hubby and me. I went all no fat, low fat and low sodium for us. I also chopped onions and sautéed them with the shredded chicken before adding to the cream cheese. Both dinners were very good and I will make this again! Thank you for this recipe! I made these last night and everyone loved them! That's a huge accomplishment with a house of 5 kids! I had a question about the 1/2 cup of shredded cheese. I just added it to the "gravy mix", which worked fine and tasted great too! I used shredded cheddar and it melted in with the soup, but I wasn't sure what it was for. On top before serving? I don't think the recipe said, no biggie, just wondered if I missed something! Thanks for sharing...it's a favorite of ours now too! OMG...these were amazing! I made these for my wife and I last night. Since it's only the two of us I baked four of them and froze the other four for a later date! They were so flavorful and the sauce really added a lot! Served them with a side of corn and it was a hit! I will certainly be keeping this at the front of the recipe collection! I made these once and loved them...made them a second time and added bacon and parmesan cheese to the chicken mixture. Yum!! Do we have to use cream cheese? Is there any alternative? Made this for Easter and it was FABULOUS. Definitely a keeper and a must do again recipe. Thanks!! made these last night and they were delicious! The family loved them! thanks! Made these with puff pastry...DELICIOUS! Thanks for an easy recipe that my kids LOVE! Made this dish tonight and was a big hit with the family. Next time I make it I will juice it up a bit with some garlic in the sauce. Liz-I think Pillsbury is making a HUGE mistake not having factories in Australia--you would love them! My daughter and I love this recipe! I make it about once or twice a month now. Usually I can make the filing and use it for 2 batches, I freeze what's left from the first batch. I always just cook the chicken in the slow cooker and when I get up add the cream cheese and butter. Anyways, great recipe. Thanks so much for sharing! These were delicious!!!! My husband loved them as well. I will definitely be making them again. Thanks for sharing. These are a family favorite! We always called them chicken roll ups, but I like pillows! we always rolled them in either crushed croutons or some Italian bread crumbs. Yum! Entire pillows freeze relatively well. But the filling is great for freezing! I usually make a big batch and freeze the leftover filling. It actually helps in making the pillows since the heat from the freshly cooked filling sometimes melts the crecent dough! Also, my variation is to add onions, peppers and a spoonful of soup to the filling! Just wanted to let you know I made these tonight for dinner! They were amazing!!! I would recommend these to every one! I will be putting them in the dinner rotation for sure!!! These sound SO yummy! Bookmarked to make ASAP and shared on Twitter and Facebook! Found this recipe on Pinterest - cannot wait to try this! I've made your "Chicken Pillows" twice now. Scrumptious both times! My husband is not a fan of crescents stuffed with anything but butter. He absolutely loved these! My daughter tried them the second time while home from college. She's going to try making them. This is by far the best recipe I've gotten off of Pinterest. These are even good warmed over in the oven. Have you (or anyone) ever tried making this without the butter? I am thinking about leaving it out-- I don't feel like the flavor difference would be huge, but do you need it inside there for any other reason? Amazing! I made these for supper tonight. They were a big hit! I added ranch seasoning to the chicken mixture. Next time, I think I'm going to roll the "pillows" in French's onion. Thanks for an amazing recipe! I made these and instead of using the saltines I used frenchs fried onions.... they were soo good! Thanks for the recipe! My sister passed along this recipe. I'm glad she did - it was great! Everyone loved it. It seems so fancy, but it's so easy and delicious! These were soooo good! My 1-year old gobbled them up, and my mom (who HATES chicken) ate two! I have an adorable pic of my son gobbling them up! I have made this with 1/2 cup cooked spinach mixed in the chicken mixture.. great recipe to play with. What kind of cheese do you recommend? Thanks. I made these again last night. The first time, I used all the chicken and baked all the pillows, then the ones that were left over, wrapped them in foil and placed them in the freezer. A few weeks later, while I was baking cookies, I placed the foil packages in the 350* oven for about 10-15 minutes, until they warmed up. The kids liked them even better than the first time. I used two crescent rolls pinched together in a rectangle so they made good size pillows.. The first time I made them, I didn't have any chicken soup so we ate them dry. This time I made the sauce and the kids said they like them both ways. Finally something both of my children will eat. This is definitely staying in the rotation. Thanks. These look so tasty! My family is very picky and not a fan of cheese or sour cream - are there any substitutions? Could I just omit them? These are great. Family is not a fan of the cream of chicken sauce so we used chile con queso sauce. Gave it a Mexican twist and they tasted great! Thank you for your posts. Tasty, I guess, as an occasional treat, but what about feeding our families heathy meals? This is a nutritional disaster. I can already taste that this would be yummy, but my brain isn't figuring out how to make crescents into pillows. Can you please elaborate? And if you could send an email to me I would really appreciate it. Thanks, Sweetie!! Another yummy pin in the making! So I don't have any eggs on hand and I so want to make these tonight! Could I just dip them in butter rather than the egg...would it make any difference? I think I a video on this recipe. I'm not sure about rolling out the crescent dough and folding it around the chicken mixture. I tried it and I had left over chicken filling. Is that suppose to happen? I made these tonight with some minor changes such as whole wheat Ritz instead of saltines and chive and onion cream cheese instead of plain. My son ate one and said, "Mom, I really like these." Thank you so much for a great recipe! I also used Trader Joe's Many Garlic sauce since we're not a fan of canned cream soups. I'm eager to try your Chiken pillows. I know my family will like them. I have made something similiar but have added bits of cauliflower, broccoli, and carrots to the mix. I did not roll them in butter and cracker crumbs. Just added some shredded cheese just before it was done baking. Did not use any sauce on them at all. My grandson ate 3 of them and didn't realize he was eating his veggies! Score one for his mommy!! I can't wait to make these! I will make one small change. I like this kind of dish crunchy! If you dip thr pillow in flour before thr egg and crumbs, you will pick up a lot ore crumbs. Works the same for fried chicken, chicken fried steak, or anything else that is "crumbified". So is it just 1 big "pillow" or do you put filling in each individual crescent roll? Could these be put together ahead of time, but not dipped in egg mixture until the last minute and then baked? Thanks for a really creative recipe. We made this tonight. It was a big hit with the kids. The only variation was that I boiled the chicken then made broth from that. I added it to fried mushrooms and then thickened with a rue, milk and sour cream. Now... if we could just make a version that ISN'T 1,000 calories each! I made these last night for dinner. They were AMAZING!!! In between all the moaning, my husband managed to declare that he thought this might be his new favorite meal ever! :P They really were fabulous. I cut the butter in half & added some green onions because I had some in the fridge that needed to get used, & we really like onions. The sauce was crazy good, too. I made these for supper tonight. They were incredible! I did make one slight change. I didn't have saltine crackers so I used Club crackers instead. I will definitely be making these again!